This nonfiction book starts with the events leading up to the Freedom Rides in 1961 and then provides a day by day account of those rides. 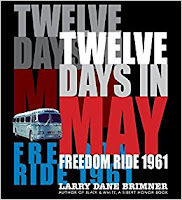 For those not familiar with the Freedom Rides, 13 men and women boarded buses in the north and headed into the southern United States in order to test the Jim Crow laws still in effect in the south. Federal law at that time had outlawed "separate but equal" facilities for blacks and whites but those laws were completely ignored in southern states. The Freedom Riders tested the laws at each stop with white riders going into areas designated as "colored only" and black riders going into the whites only bathrooms, waiting rooms and lunch counters. The deeper south the Riders went, the more opposition they encountered including beatings from the KKK and nearly being burned to death when their bus was set on fire all while some law enforcement officers ignored what was happening. The Riders had dedicated themselves to nonviolence and when images of the racist acts were publicized, it was a wake up call for some of the U.S. The story of the Freedom Riders is amazing and horrifying but the treatment in this book didn't grab me as much as I expected. However, it is presented in a very straightforward, easy to understand manner and would definitely be a good introduction for those unfamiliar with the time. It is also a good bok to show people today how easily certain rights can be taken away when people don't stand up for what is right.